That's a nicely done M-05. Very cool. I have a few questions about some of the parts though: What is the metal part attached to the chassis near the pinion end of the motor? And, what is the carbon piece on top of the chassis, just forward from the servo? What kind of speed controllers are people using for their M05? I am building mine and I am looking for a brushed ESC with lipo cutoff for under $50. The M05 kits come with one. The TEU-101BK has a LiPo cut off? The only M-05 that currently ships with a lipo cutoff capable ESC is the FIAT 500 Abarth. It has the TEU-104BK. All other M-05s and M chassis are supplied with the TEU-101BK, which does not have a cutoff. Quick question regarding the Tamiya Aluminum Damper set. The directions call for a silicon o-ring on the inside of the shock body, and a regular 3mm o-ring on the shock shaft. The kit comes with both clear and black o-rings, which is which? If I were to guess, Id say the silicone ones are clear, but usually when I guess Im wrong. If I were to guess, Id say the silicone ones are clear, but usually when I guess Im wrong. Your guess is correct about the o-rings. I've heard from other people that the kit dampers are fragile. Go with the aluminum dampers if you decide to replace them, item #54000. Yea, I was referring to the aluminum dampers with my question. I heard so many people say bad things about the clear plastic ones on the m05 pro, I decided to upgrade right away before I even built the kit. I just wish they were more clear about which o-ring was which in the aluminum damper assembly directions. Do you still have it? I sent you a PM, if you have a spare part. It's the upper arm lock, attached on the top of the gear case. It's similar to MN008 on this link. if the car traction rolls what are some things I can do to make it a bit more stable? if anytime I go around a corner the back end swings around? if I have no steering? if I keep going through gear sets or something along those lines? managed to get my hands on one of these. Assembly is simple and fit in the M05 is very good with a little movement from side to side but nothing to worry about. Only problem I had was one of the locating pins was a margin too long and it would distort the bearing that trapped it. A simple rub of the end of the pin on wet and dry paper solved that. Last edited by cannon; 10-30-2009 at 02:20 AM. Whilst checking the operation of my M05, I have noticed that there is a lot of vibration when the steering is at (or near to) full lock and under power. For the first ~50% of the steering travel from neutral everything is normal, but any more steering travel than that and the vibrations start and get worse with more steering. 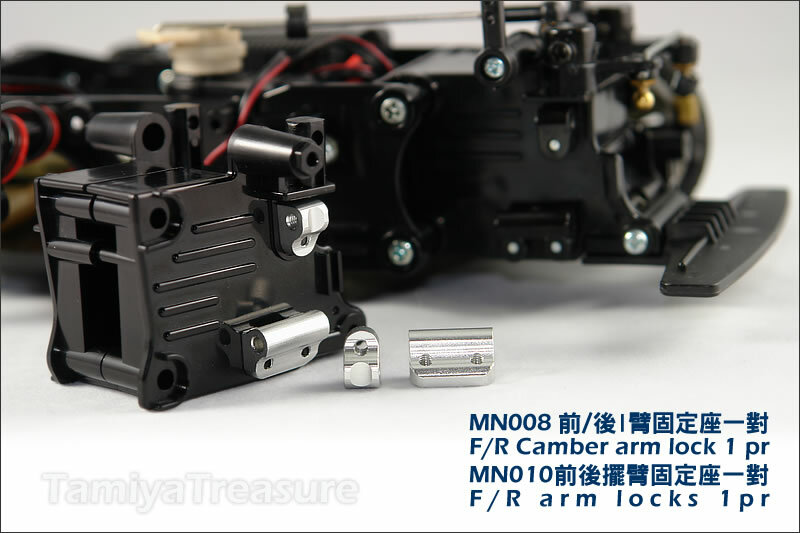 I am using Tamiya rebuildable universals, and standard M05 outdrives (with an o-ring). There doesn't appear to be any binding in the steering throughout the full suspension travel. I have tried removing the o-ring from the outdrives, and shimming any sideways play from the UJ's in the uprights, but the vibration still occurs. I then tried my M03, which also has Tamiya UJ's, and that does the same thing, only the steering gets nearer to full lock before the vibration starts. Is this normal, does anyone else get this with their mini? I'm thinking maybe this is a case of the UJ's reaching the limit of their 'normal' travel and then binding when more steering is applied? I don't think I've ever tested the steering whilst also under power on the pit stand before, normally just checking steering or power independently, so I've never noticed it. The only other cause could be that I'm running a fixed axle/spool in both the M05 & M03, and that is somehow causing the vibrations. I will have to try a gear/ball diff in one of the cars to see if the vibration goes away. Last edited by Toon; 10-31-2009 at 06:56 PM.